Well, it’s been more than a week since ISTE ended and it’s still strong in my mind. CUE 2010 was my first ed.tech conference and this was my first one working in the exhibit hall. While CUE was my first exposure to what an ed.tech conference is, ISTE was perhaps my first exposure to what an ed.tech conference can be. First of all, thanks to Luidia for flying me out to be the “experienced teacher” in their booth. They were ever so kind in bringing me along, since I otherwise wouldn’t have known the excitement of ISTE. Second of all, my apologies to those who follow me on Twitter and were bombarded with eBeam tweets. I just wanted to show my appreciation for allowing me to take place in this whole thing. I’ll definitely write soon with some of my favorite tools and the ways that I am planning on integrating all these great ideas into my classroom, but first I just wanted to reflect on the whole experience. My experience was so-so on Monday, as I was just getting acclimated. But Tuesday was a wildly wonderful day, peaking at lunch with an unexpected chat with Larry Anderson (@nctplarry) and Bobby McGuire (whose wife leads @rockourworld). I learned more in that lunchtime discussion than in any of the sessions and then learned much more when I participated in the Birds Of A Feather: Web 2.0 discussion at the end of the day. It is truly wonderful to be able to exchange ideas rather than just sit and take in ideas, and my hope is to do more of the exchanging during ISTE 2011 and other future conferences. I had no idea about the Blogger Cafe, where the tweet up was precisely (thanks to @LisaGreathouse of @simpleK12 for making me feel welcome even though most everyone was already gone), the ISTE mansion, or the fact that some of the people I follow on Twitter were also in attendance (@mbteach & @kylepace to name a couple) and had #edchat live! Perhaps a little bit because I didn’t do the research and also because I was registered as an exhibitor rather than a teacher, but I’m determined that ISTE 2011 will be a lot more of the collaborating and seeing people f2f… Who’s in? Also, finally, Peter Reynolds (author of Ish and The Dot… @peterhreynolds) is incredible. I met him at CUE, where I shared my love for his books, and this time reconnected, said a great thank you for allowing my class to have a copy of Animation-ish, and he proceeded to adorn my badge with my own artistic character. Thanks again to everyone who made ISTE (and my experience there) possible! 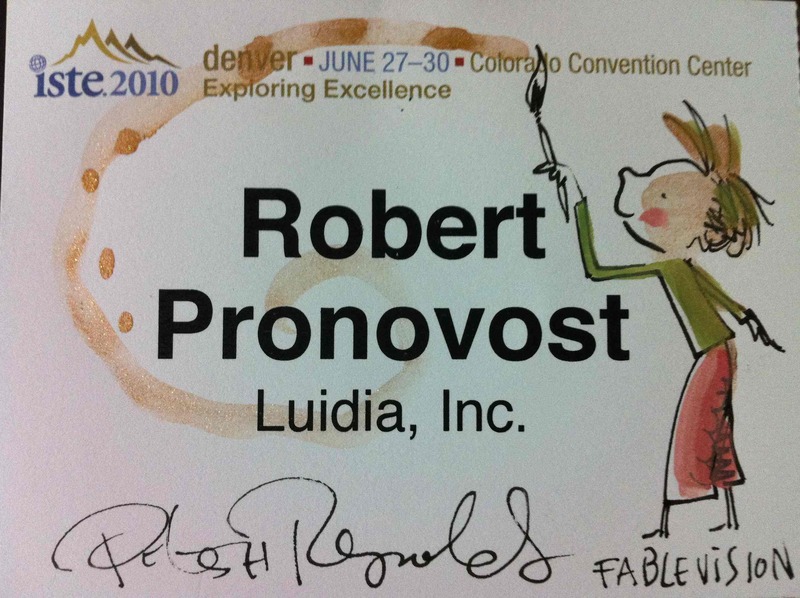 This entry was posted in Conferences, Forging My Path and tagged ISTE, Peter H. Reynolds, tweetup, Twitter. Bookmark the permalink. I wish you had found me before the conference. I have somehow ended up being the unofficial “Newbie” support person. (Well—I do know how, but it is a long story.) I’m glad you had a great time at ISTE and I hope you make it to Philly next summer. Congrats on the new blog. I have found it is a great way to connect to my PLN beyond Twitter and Facebook. Looking forward to learning with you. Very excited to connect with you and meet up with everyone at Philly! Great reflection. It truly is an amazing conference. I too, attended ISTE for the first time and now that my eyes are open to the true gifts that conference can unlock, I am hooked and already looking forward to ISTE11! You nailed it on the head, that the conversations are so important and the ability to meet other educators and not only listen to ideas, but share them make this conference a great opportunity for ANYONE to learn and share ideas. It contains such enriching conversations and next year as you get more f2f time and hold more conversations you will continue to see such self-worth and excitement that can only be seen at ISTE! And yes, I am in on those conversations! Great first blog post. I just started a few days back, and hope to also get some ISTE content in there soon. Great job–Diving in and getting it out there! Thanks! I did have a great experience. Working the booth is fun, but like you said, so much great collaboration happening at the bloggers’ cafe and everywhere. Very excited to do more of it next year at ISTE11!